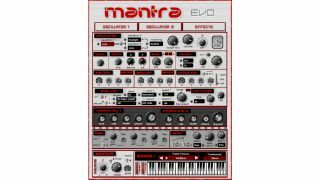 Mantra Evo is said to be two synths in one. Promising to combine FM and phase distortion synths, Beatassist's Mantra Evo is a new free Windows plugin instrument. Each of the synth engines has a morphing system that enables you to turn basic waves into more complex ones, and comes with five envelopes. Modulation is in the FM style, with kbd and depth controls, and both synths have an LFO and a chorus effect. Other effects include distortion, reverb, EQ, stereo delay, a trancegate and an octave stepper. Check out the Beatassist website for more details and to download Mantra Evo for free. It's available as a 32-bit Windows VST plugin, so you'll have to use a bridge if you're running a 64-bit system.